ANOTHER FINE COLLECTION BROUGHT TO YOU BY. STAMPSWEIS WORLDWIDE COLLECTIONS RIVERSIDE, CALIF. THERE ARE APPROXIMATELY 614 MINT plus or minus CONTAINS MNH? (if loose or mounted), MInt and Used STAMPS AS SHOWN............. Generally NOT ALL ARE SHOWN IN IMAGES JUST A GOOD CROSS SECTION FOR YOU TO GET AN IDEA OF WHAT IS HERE! Please view each lot separately........ Possible especially if glassines, extra sets of pages or stock sheets, etc. Are present in any lot.............. Please wait for invoice before paying! NOTE: UNITED STATES POST OFFICE HAS RECENTLY ALLOWED FOR FIRST CLASS "WITH TRACKING ABILITY" AND THIS IS CONSIDERABLY LESS THAN PRIORITY IN MOST CASES. HEAVIER LOTS PRIORITY WILL STILL BE BEST ROUTE TO GO AND CHEAPEST WITH TRACKING OVER 4 LBS................. Your Lot will be Insured to any foreign country if it is available. If you are concerned about this happening, please let me know what special services you wish and I will include them in your invoice. So, please wait for a combined invoice! NOT ALL PAGES OR STAMPS ARE INCLUDED IN THE PICTURES LISTED ON THIS LOT! Please note that any albums or country pages can not be guaranteed to have every page to the set. It is impossible for me to check this! That is why I take many images for you to see. Once and item is paid for I do remove the pictures from my website and if you wish to have them for reference please copy them to your computer! Check out Stampsweis com for more Info. Note If you ever see a picture that does not match the " Title description " it may be an error and so, please contact me and I will check to see if it was an imput error when listing. 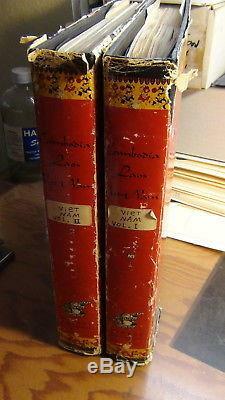 The item "Vietnam stamp collection in 2 vol. Minkus Specialty albums to'75 or so" is in sale since Tuesday, April 17, 2018. This item is in the category "Stamps\Asia\Vietnam".